Forget a guard dog, get a protection parrot! ‘Beware of the Parrot’ is not a sign you tend to see on houses but that may all change after Rocky the parrot single handedly (single beakedly?) brought down a burglar recently in Kent. 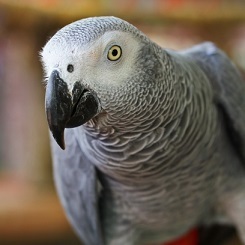 The intruder attempted to steal the parrot, along with other items, as they can be sold for around £500. However, when he reached in to grab Rocky, the burglar busting bird bit him, drawing blood which he left around the house as he made his getaway. The police were able to take DNA from the blood which matched him to records on the police database and he was promptly busted for the break in. See the news story. So, if you think that a guard dog is your best bet against an intruder maybe you should consider a protection parrot? !